This product is in support of our Nations Stop The Bleed campaign launched by the DHS. The Public Response Bleeding Control Cabinet is an all in one Emergency Response Cabinet and Training Center . It comes complete with ten (10) individual throw kits for individual victims and all critcal items needed when treating several victims suffering from severe trauma injuries including massive uncontrolled blood loss. The kits are all self contained in a professional sling pack designed to grab and go or worn over the body while deploying kits. This portable yet professional bag allows you to grab the pack and respond anywhere with all 10 lifesaving kits. This Cabinet is a readily identifiable and internationally designated medical cabinet made of lightweight and rugged aluminum. It is alarmed for extra security and warning/awareness to deployments in public areas. This cabinet keeps all integral medical kits secure but ready to deploy instantly. The ten (10) Pocket Bleeding Control Kits / throw kits contain a tourniquet, a Combat Compression Bandage, Sterile Packing Gauze, a set of nitrile gloves and a field instruction / Casualty Care Card. These individual kits can be dropped, kicked or thrown to individual victims in or around a mass casualty scene. The critical lifesaving items contained in these kits are currently used by medical staff to treat life threatening injuries such a those incurred by penetrating trauma injuries with severe blood loss. 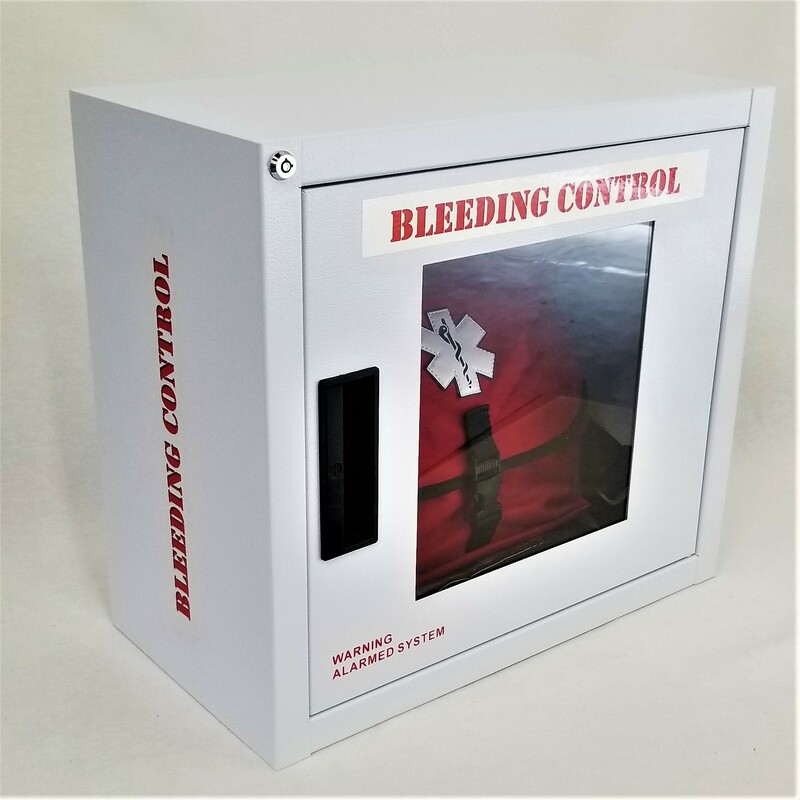 This Bleeding Control Cabinet is currently in use at several public malls, places of worship, mass transit areas , schools and various buisnesses globally. This cabinet is also a complete training center and contains an OSS Training Module on the inside of the cabinet. The Training Module is removable and deployable into any environment. It has everything you need to teach any and all staff that may have to deploy these lifesaving items into a critical incident. It also comes with a Practical Application video and Training Powerpoint to aid those learning about the use of these kits.